In this video, Dr. Huntoon discusses What To Consider If Your Doctor Wants Your Child to Receive Medication and what you need to consider when it comes to the health of your child. ARE YOU PUTTING YOUR CHILD AT RISK? There is a lot of hype in the media lately about the harmful effects of not vaccinating your child according to the Government Standards. And there are a lot of unanswered questions around vaccinations and if they cause heath concerns. Many parents are concerned about the health risks of immunizing their children. And they are continuing to tell parents there is no concern what so ever by vaccinating your child. And there is mounting evidence that injecting your child over 35 times in a 5 year period with harmful neurotoxins known to cause nerve degeneration as a requirement to live in the US, go to public schools, and not be ostracized by society is a problem most parents no little of what to do. As a service I try to educate my patients on current Law as it is written in my former home State of New York. This is done in an effort to fully inform my New York based patients about their legal rights to have a choice regarding the immunization of their children before they start school, as well as what their options are regarding these rights. Below you will find a brief discussion on the risks associated with immunizations and what to consider when deciding whether to immunize your child or not. I hope this information proves helpful to my patients past and future. The immunization dilemma is faced by many new parents every year, and as a holistic chiropractor I feel it is my duty to offer information to my patients and allow them to make their own educated decisions on the issue. The information from this article was collected from from several different books on the subject. As a service to my patients i keep these books within my office and am happy to lend them out for further reading. The two books I found most informative were "Immunization Theory vs. Reality" by Neil Z. Miller, and "The Consumer's Guide to Childhood Vaccines" by Barbara Loe Fisher, Co-Founder and President of the National Vaccine Information Center. These books offer valuable information on vaccinations and what every parent should know and consider before blindly allowing and accepting the recommendations to have their child vaccinated. As a new parent it is vital to make informed decisions on every aspect of your child’s medical care. Vaccines theoretically work on the principle of protection by artificially stimulating the Immune System to produce antibodies, small molecules of protein that attack invading organisms, to overcome a disease in the same way the natural disease stimulates immunity. Protection from disease via vaccination depends upon the theory that periodically challenging the Immune System with small amounts of inactivated viruses and bacteria or attenuated (partially inactivated) live viruses will force it to produce antibodies that will confer immunity in the same way that a bout with the natural disease confers immunity. However, vaccines do not work in the body in the same way that natural disease works in the body. When bacteria or viruses enter the body and disease progresses in the normal way, the Immune System is stimulated to produce a type of natural immunity which is often permanent. Vaccines, which are most often injected directly into the bloodstream or swallowed by mouth, provide an artificial, temporary immunity. Sometimes vaccines fail to provide any immunity at all. This is why multiple doses of many viral and bacterial vaccines are required to "boost" and extend protection. Critics of the mass vaccination system point to the fact that before many vaccines were introduced in the early 1900's, death and injuries from childhood diseases in technologically advanced countries such as the U.S. were already on a steep decline because of better sanitation, nutrition and health care. Although vaccination has been credited with eradicating Smallpox from the world and eliminating Polio from the Western Hemisphere, there is a scientific question as to whether vaccines can eradicate all the viruses and bacteria for which we vaccinate, no matter how many booster doses of vaccines are given. Some viruses and bacteria that cause disease in humans also live in animals and many viruses and bacteria are very adaptable and can change their character in order to survive. This may have been the case in the late 1980's when, after two decades of measles vaccinations within the U.S., a more virulent type of measles was seen in an outbreak among American children and adults. With so many gaps in scientific knowledge about the long term effects of mass vaccination, there is a growing concern that the mysterious rise in Immune and Neurological disorders during the past four decades; including: learning disabilities, attention deficit disorder, asthma, autism, otitis media, diabetes, rheumatoid arthritis, lupus, multiple sclerosis, chronic fatigue syndrome, cancer and other chronic health problems may be caused in part by repeated manipulation of the immune system by giving multiple doses of viral and bacterial antigens in early childhood. It is unknown whether the use of a growing number of multiple viral and bacterial vaccines is weakening the human immune system or causing genetic change. Some doctors maintain that a child's immature Immune and Neurological Systems, which develop most rapidly within the first few years of life, are also most vulnerable to toxic insults in the first few years of life. Others believe that it is important to wait to determine whether a newborn has an underlying Neurological or Immune System disorder or other undiagnosed health problems before vaccination begins. Some parents, who have made the decisions to vaccinate, are choosing to begin vaccinations at a later age and are taking special precautions to keep their unvaccinated children out of daycare or crowds to reduce the risk of exposing their children to adults or other children who may be sick with serious disease. Many parents, who have decided not to vaccinate, are consulting health care professionals who specialize in Chiropractic, Homeopathy, Naturopathy, Traditional Chinese Medicine (including acupuncture) and other holistic health care therapies which focus on enhancing the functioning of the immune system and maintaining wellness. 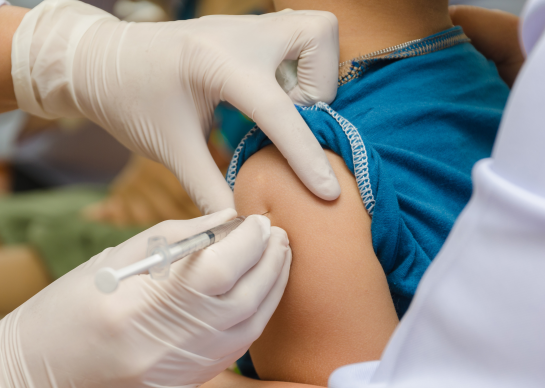 Other parents, however, especially those with children in daycare, are choosing to begin vaccinating early but are allowing only one or two different vaccinations to be given simultaneously rather than three or four at a time. Some parents are choosing to space vaccinations further apart so that, if a reaction occurs, there is less confusion about which vaccine may have caused the reaction. Because the U.S. Federal Vaccine Policy today allows a one-year old child to be vaccinated with as many as 10 different viral and bacterial vaccines on one day, you should consider whether you want your child to get just one or two vaccines or many different vaccines on one day. Whatever option you choose, becoming better informed about your options will make you more comfortable with your decision. Whenever your child receives a vaccination, it is a good idea to check the vial of vaccine to make sure it is the type of vaccine that you have agreed to give your child and that the expiration date on the vial is not past. You may want to consider asking for a new, unopened vial of vaccine. A parent should always ask for their own personal copy of the vaccination record to keep in a file at home. This record should include the type of vaccine, date and lot number. If you are a new parent, or are planning on becoming a parent for the first time or perhaps again, you should consider doing this in the best way possible. Learn from your previous mistakes, or learn from the mistakes of others. Take the time to get fully educated on the subject BEFORE you blindly accept the insistence that it has to be done, put out there by the medical establishment. Fear is a strong motivator, and becoming fully informed allows you to make a solid decision without fear of negative outcomes. Speaking with your Holistic Chiropractor and evaluating all your options is vital before making your final decision. Dr. Huntoon has great success supporting healthy Immune Systems in children for over 25 years. His perspective is to never inject any medication that will bypass the normal entry into the body WITHOUT knowing the consequences. And you will never know the consequences BEFORE having the vaccine administered. In fact, you may not know the harmful consequences until they begin school. Don't let this be your child. Do Your Research! Since we ALL know people who are having children, please forward this information to them and ask them to consider what is written here. For more information about vaccinations, please call the office at (845) 561-2225 and ask us to send you the information entitled Eight Important Questions to ask BEFORE you vaccinate your child, along with the recipe for developing a strong and healthy Immune System NATURALLY within your child. This is a free service. There is no vaccine to protect against Alzheimer's, Autism, Autoimmune Disease. You can help protect your child by considering the consequences of injecting these substances when you HAVE NO IDEA WHAT THE EFFECT IS GOING TO BE BEFORE RECEIVING THE VACCINE!